At 135mm / 5.3" with a stiff integral damascus blade by Nick Anger, this Cherry Burl Fillet Knife is designed beautifully for daily use on the in the kitchen, on the boat, along the shore or in the field. 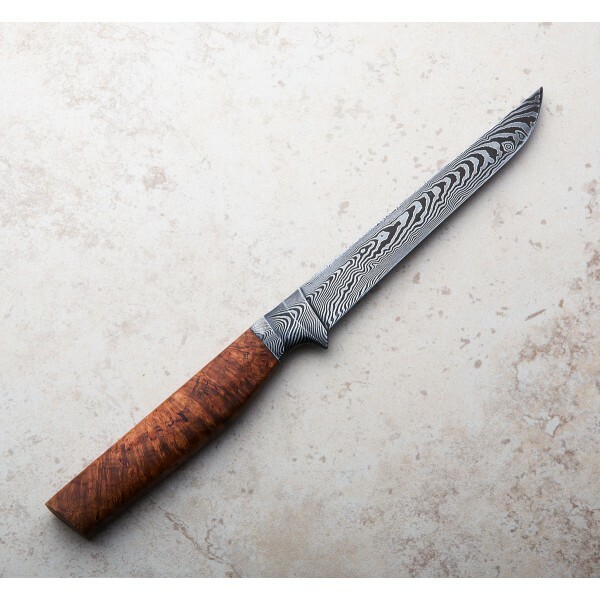 Forged by hand from Nick's housemade 1080 / 15n20 carbon damascus, the stunning integral bolster is shaped with mesmerizing curves and lines, and the cherry burl does justice to the blade. 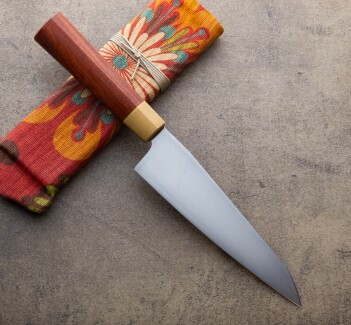 Although the blade is relatively stiff and not suited for jobs requiring a longer, truly flexible blade, there is just enough flex toward the tip to provide even more versatility without compromising strength. 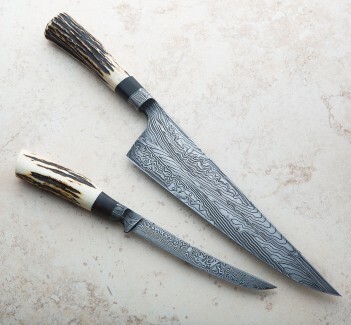 Creating his own small-batch damascus steels in northern Vermont, Nick Anger emphasizes functionality through design and precise heat treatment, yet his knives are arguably as beautiful on the eye as they feel in the hand. 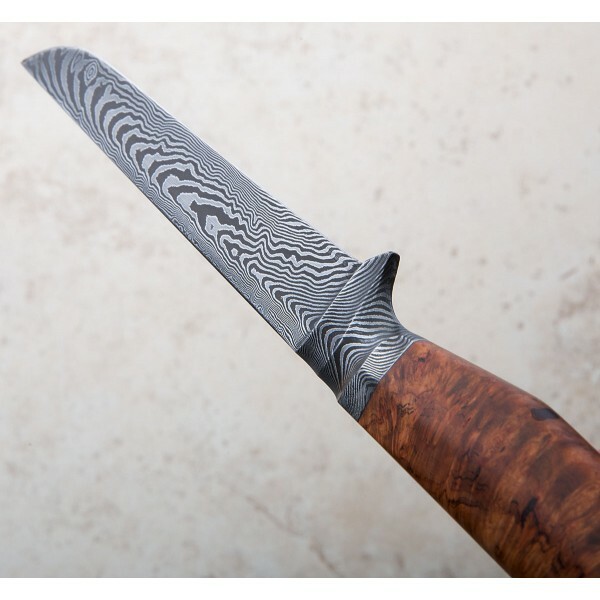 Employing the world's best high-carbon steels Nick forges each knife from scratch, no two the same, he constantly experiments and innovates in terms of the subtleties of geometry and material combinations, creating one purpose-built work of art after another. 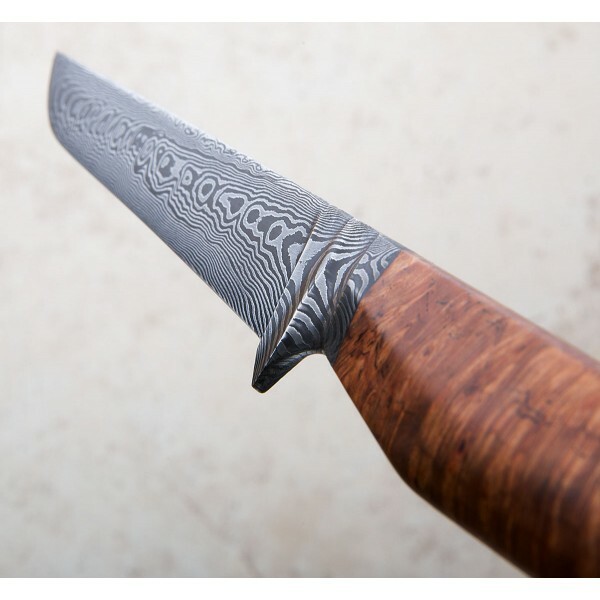 Blade: 135mm / 5.3". 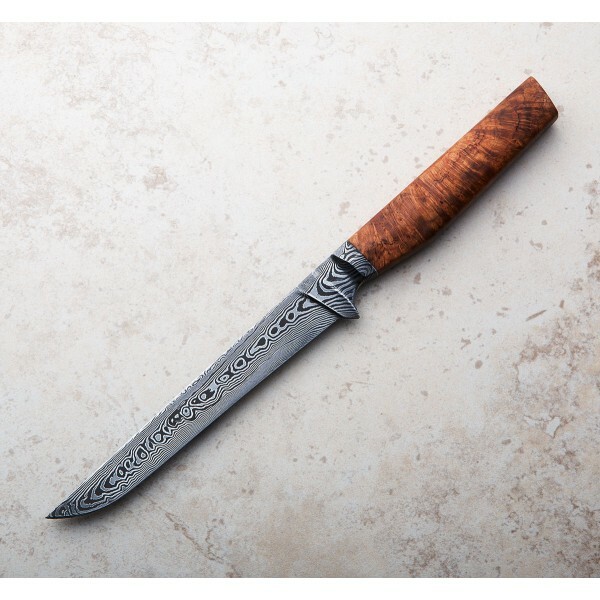 Overall length: 259mm / 10.187". Blade width at heel: 2.8mm. Blade width 1" from the tip: 1.00mm. . Blade height at heel: 20mm. Weight: 2.6oz / 72g. Blade: 1080/15n20 damascus. Handle: Cherry Burl.